As 2016 winds down to a close and we celebrate the Holiday Season, it’s a perfect time to give back and pay forward! The HIM profession has never been more important to patients, providers, and the health care industry. Trusted, quality health information is critical for the health of a Nation and her citizens! Together we can help Health Information Management (HIM) turn the world! 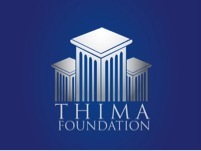 Please join the THIMA Foundation as we raise funds to provide educational opportunities for students and practitioners of HIM. Goal – To award five $1,000 scholarships to HIM students at the THIMA Annual Meeting in March, 2017.